You might have noticed your teen hinting at the fact that they want a room that's totally cool and unique, especially if they're getting up in age. When kids finally become teenagers, all of a sudden they have to have the most trendy, cool and awesome gadgets and gizmos and we don't blame them. Being a teenager is about self-expression and learning how to be yourself in a world that often tries to tell you otherwise. A teen's bedroom is often the first place where they can do this and truly have a space that's so uniquely "them".One of the things they might be wanting to change is their bed and that comes as no surprise when you consider the fact it's the focal point of a bedroom. The only thing cooler than these sweet teen beds is our new look! We've upgraded our buying guides to be more visually appealing, easy to read, and more mobile friendly! Check out our new Criteria ratings and vote on your Most Important Criteria below! Sometimes a little extra space is all that you really need. Loft beds allow teens to set up their room exactly how they want while also giving them back much-needed space that a normal bed had previously taken up. This innovative design is modern and something that many teens are turning to because it's not only nostalgic of bunk beds but allows for plenty of extra space. It's ideal for smaller rooms or even as kids get older and need a workspace for school or crafts. This bed isn't for those who have a fear of heights! We're just kidding -- It's really not that high, although it is quite lofty when it comes to elevated beds. This half-bunk is optimally designed to save space and provide your teen with a new area for whatever they want. The bed itself does not take up any room on the floor of their bedroom since it is raised, leaving them the creative freedom to arrange their room however they like. Whether they put a desk underneath, some comfortable chairs or a beanbag, or even a TV set up with their game consoles, this bed will make it work. The minimalistic design of this bed is what really catches our attention. It's a great unisex bed that's not likely to clash with any existing decor. It's built in such a way that it almost seems invisible when you enter a room and will really separate your child's sleeping space from their work and play spaces. There are ladders at either end to provide easy access to the top bunk but they're also minimal and don't take up more room than necessary. The entire frame is built from powdered steel so it's not likely to bend, break, or give way very easily. In fact, this bed can hold up to 250lbs without budging an inch. Daybeds never really went out of style and this one comes with an air of maturity. It's classic and elegant and perfect for teens who love having overnight guests. When not in use, it can be set up as a makeshift couch and will be the perfect lounging space for your teen and his or her friends. It's perfect for those extra unexpected guests and when it's not holding a twin mattress, it can be used to put away all of your teen's extra things that had no permanent place prior. Let's talk about the decorative aspect of this bed now. Not only is it constructed well, but it also has classic New England-style wood slats and finials that make this frame perfect for nearly any bedroom. This classic appearance will never go out of style regardless of what the theme of your teenager's bedroom is. It's neutral yet mature, marking the time of passage for them between having a "kid" room and a more "adult" room. Perhaps something a bit lower to the ground is more your child's speed. If they're a fan of sleepovers (or storage space) then a trundle bed is definitely the way to go. 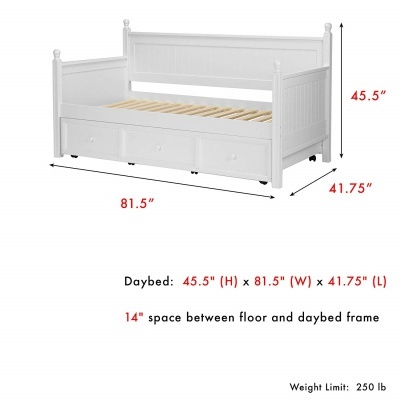 The Fashion Bed Group doesn't provide just any old trundle bed design, though -- This modern-style wood frame is intended for versatility at its finest, featuring a pull-out trundle drawer that can go from storage to a spare bed in a matter of seconds. The versatility of this bed is unreal and really takes storage to another level. It can be converted quickly and easily with no fuss whatsoever, leaving your teen to enjoy the company of their friends rather than stress over them sleeping on the floor. If a place to do homework or just read and hang out is something that your teen needs then the Avalon might be the right choice for them. This bed features a full-length desk with no need for additional furniture which saves on tons of space. This desk even features a mini drawer space underneath that's perfect for storing notebooks or even a keyboard to save space on top of the desk. Coaster Home Furnishings has truly thought of everything, including where to save even more space and add storage. This is perfect for the avid bookworm or computer-lover in your family. Teens will love the fact that they'll be saving space but not having an extra desk taking up space in their room. The separation of sleeping space and workspace is a unique and innovative design. This half-bunk is raised so that the bottom space is wide open but you won't need to worry about purchasing anything extra -- The desk is built-in! This black frame comes complete with a sturdy metal desk that sits just underneath the top bunk and is a standard size for most computer chairs. It spans the length of the bed itself so your teen can feel free to put their laptop, books, and even some extras on this desk without fear that it won't hold. Canopy beds will never go out of style and truly add a level of magic to a room. This would be popular with any young girl, if only for the fact that teenagers love their own personal space. This bed might look simplistic but the detail lies in its comprehensive design. The first thing you'll notice about this metal frame is the side-scroll design that has been depicted in the metal headboard, baseboard, and sides of the frame. Each is adorned with a heart followed by swirls that add a level of elegance and glamor to this simple metal frame. The second thing you'll notice is the addition of a canopy which really goes hand in hand with the overall theme of this bed. With choices of gold, pewter, white, or even pink, your teen will be overjoyed with the customization level of this frame. It's easy to match curtains too and will become her own private space in no time! While your teen will have a blast picking out canopy curtains, they'll be thrilled to know that the actual color of their bed frame can be changed to suit their personality as well. Now that's what we call customization. The canopy allows your teen to provide whatever type of color, theme, or atmosphere she wants, making it a key element to a creative bedroom. The other key feature of this frame is the support it provides. With metal slats that lay across, the need for a platform or box spring is optional since it provides plenty of support on its own. Aside from purchasing curtains, this frame is ready to go and requires nothing else but a mattress. 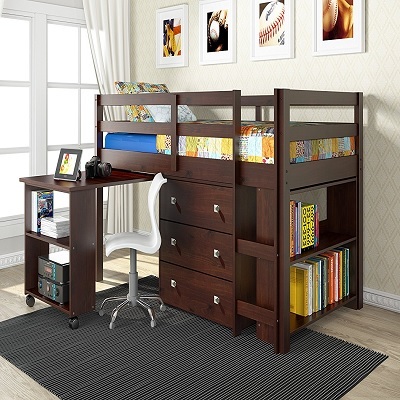 This bed is a must for any teen who is gearing up to go to college or just really enjoys organization. It comes with a myriad of surprise shelving including a surprise -- A mini pull-out desk! 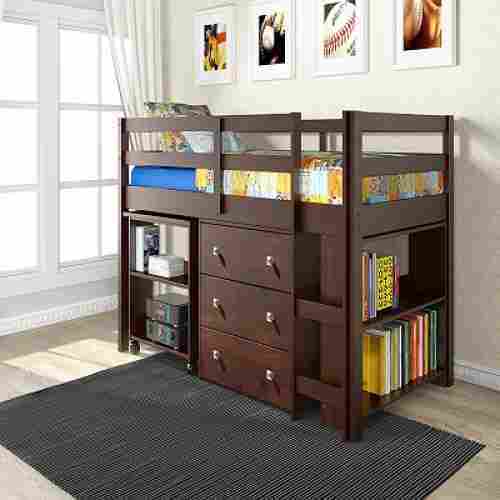 DONCO Kids is fairly well-known when it comes to youth bed designs and this loft bed is mature and stylish for teens. The rich, deep brown color adds a level of sophistication that many teens might be looking for when it comes to a new bed and the style itself is contemporary and modern. The unique thing this bed has going for it is all its storage but you won't find just any storage here -- Each compartment is intended for storing various things. 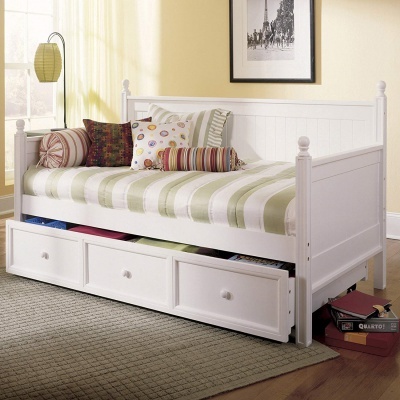 Your teen will find drawers, shelves, and even a bookcase at the base of their bed. It's perfect for older teens who need room to store their study books or teens who have plenty of growing collectibles that need a space. It's mature and extremely ideal for growing teenagers who have surpassed bunk beds and want something a bit more elegant and adult. The storage space lends itself to a sophisticated look and your teen will feel more mature from the second they walk into the room. The addition of a bookshelf is something that we really love about this frame. It's a bold choice for teens but it's something they'll be motivated to fill up and will love displaying all of their favorite novels, comics, or even movies.T here's really nothing to hate about this bed frame. These shelves are sturdy and do their job in providing support for the bed above but are also strong enough to store a decent amount of items on the bottom. The space behind these shelves is hollow so your child can store much bigger items or bins underneath, without anything protruding into the room or looking cluttered. This bed is like something straight out of a fairy tale. 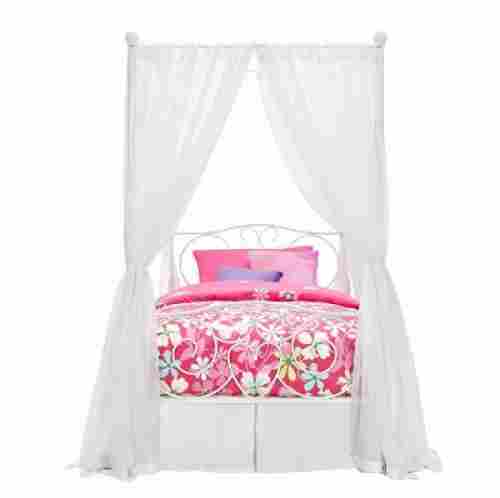 It's playful yet mature and will bring a little bit of magic to any teen's room, complete with the option for a fun canopy. This frame is more for the teen who wants to design her room around her bed of choice since it is so bold. This carriage-style frame is sure to evoke fairytale imagery and help to transport them to a magical place each time they close their eyes. his bed is quite playful and unique in style and that's something we love to see. It's not overwhelmingly girly yet does add a feminine touch that's just enough to make the entire room seem cozy and welcoming. A canopy bed can really help to create a private space for your teenager that makes them feel safe and secure. It allows them the freedom to design their own bed around the theme of their choosing while also adding a bit of extra flair and privacy. Although it looks like something out of Cinderella, it's quite mature in appearance and not too in-your-face as far as feminine bed frames go. It can be adorned with any type of fabric which opens your teen's options even further and with the simple switch of a color, this bed can go from child-like to mature. 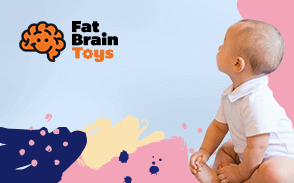 It's cute and whimsical and perfect for the child who never wants to grow up too quickly. DHP seems to hold all the cards when it comes to metal bed frames that denote a certain type of design or theme. Sometimes basic is just better and that's exactly where the ACME Sunburst fits in. This canopy-style bed is subtle yet sophisticated and has the option of extra-added privacy with a simple canopy. 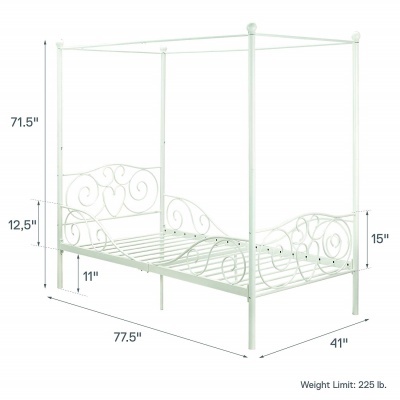 Last but not least is a canopy bed fit for a queen (or king!). This black metal frame features a high canopy that will give your teen the feeling that they're sleeping in some dreamy, faraway place. It's sturdy enough to hang various types of fabric from so your teenager will be able to pick whatever they please to create their private sleeping quarters. The neutrality of this design lends itself to be gender-neutral but also room-neutral. Black is universally a neutral color and while it has a gorgeous design, it won't likely steal the stage of the overall theme of a room. The base of the frame is minimal yet detailed enough to avoid being boring and will stand out without looking out of place. . This bed exudes elegance and charm and that's exactly what it'll bring to any bedroom! This bed has extra storage in the bottom, plenty of room for friends who love to sleep over, and will provide plenty of support. There's nothing not to love about that except for the fact that your teen will probably never want to get out of it! This elegant Captian's Bed is perfect for the teen who wants a little bit of fancy flair in their room. This simple frame comes in two colors, white or black, which will look absolutely stunning in any room set up. The trundle underneath is incredibly easy to pull out as it's crafted via a wood-on-wood glider and they'll even find some storage space there as well. 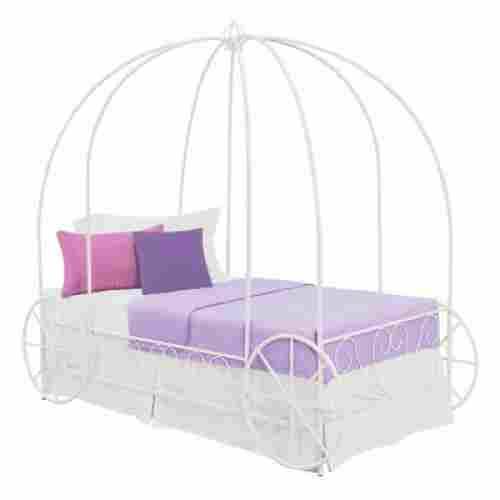 This bed is perfect for any teen who has a lot of accesories or clutter in their room. It provides them with plenty of storage so that all of their favorite belongings have a home and their room can be kept nice and tidy for when their friends come hangout. Although it looks simple, there are plenty of features about this frame that we love. The added height of the bed sets it apart and makes it unique while allowing for plenty of extra storage space underneath, which also means that your teen's guests won't be sleeping level to the floor. The wood slats used in the base of the bed mean that you don't need a box spring in order to use this frame. Simply place the mattress on top and your teen is good to go, with all the support necessary for a good night's sleep. This bed holds more surprises than not and is perfect for the innovative teen who loves to entertain his or her friends. It screams chic and metropolitan and will definitely be a unique centerpiece in any bedroom, not to mention, it's 100% comfortable. We have to admit, as far as beds go, this one is pretty cool! 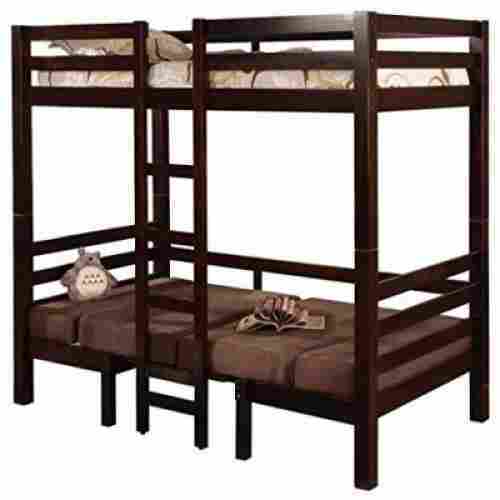 The Joaquin Twin over Twin Loft Bed is convertible in so many ways but we're going to focus on two. 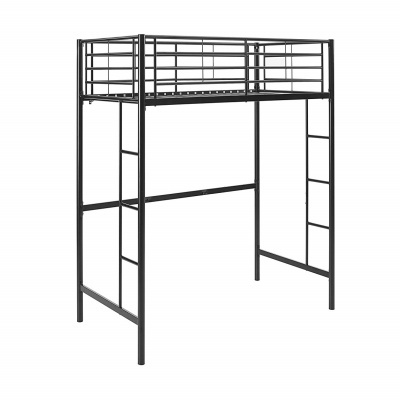 Teens are absolutely going to love the fact that for starters, they're getting a half-bunk as a bed because it means more space for them in their room to design it however they want. This bed doesn't just stop there, though -- Beneath the bunk, you'll find that the bed itself is actually a double bunk. When not in use as a spare bottom bunk for a guest, this crazy, creative lower half can be converted into two chairs as well as a makeshift table in between. It's perfect for kids who love sleepovers but also love having their own space to write, do homework, draw, or whatever other hobbies they'd normally sit at a table for. This is something that teens will love to show their friends and something they'll appreciate even more when those friends can sleepover without sleeping on the floor. Just looking at this bed makes us feel motivated and ready to create something. That's the same way your teen will feel when they realize they have space all to themselves and that their bed can be manipulated to suit whatever they need it to. This frame is innovative and brilliant when it comes to saving space while also adding furniture that's inconspicuous and minimal. The spare cushions are what create the second lower bunk and the table slat can easily be slid up and down in order to create a sleeping space or a desk. Platform beds are making a comeback and we were thrilled to include this one on our list. It's mature and very adult, perfect for the teen who needs more space but also wants to make his or her room a bit more sophisticated and modern. There's an air of sophistication when it comes to this bed and its design. The quilted pattern is very metropolitan and formal and will make your teen feel like they're really growing up. They'll be able to fit books, clothes, gadgets, gizmos, and nearly anything else that can fit in a 12-inch deep space. The mattress of the bed is easy to lift up and they shouldn't have any problems doing it on their own. 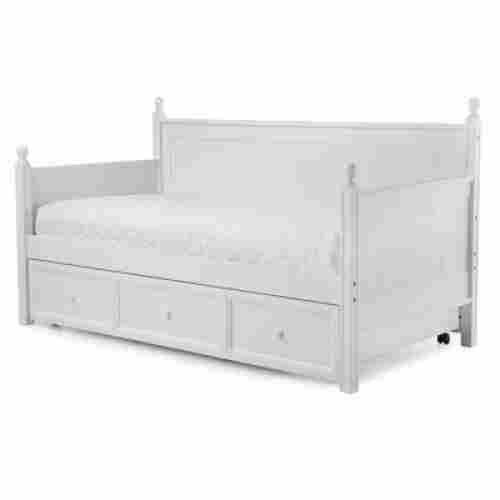 Storage needs are unisex which means this bed would be great for boys or girls. It's neutral and won't clash with other bedroom themes but it's also very mature and shows no sign of being an adolescent bed frame. dditionally, the entire frame of this bed is outfitted in a square-patterned fabric that's soft and durable, adding a level of elegance that many other beds just don't have. A surefire way to be a cool parent is to let your teen pick out what they want in their room. They might not even know that certain bed frames from this list even exist which is why we're here to help you out. However, we first needed to come up with a set of criteria when it came to figuring out what was worth it and what wasn't. Our most important point first and foremost had to be the issue of safety. If a bed frame was certified and we couldn't find any solid proof for the length of its durability or its brand reputation, we tossed it out. In order to be a great bed, it needed to be sturdy, structurally logical, and functional. There's no product out there that's perfect which is why we have a pro/con list for each one, but it was our duty to find something as close to perfect as possible. 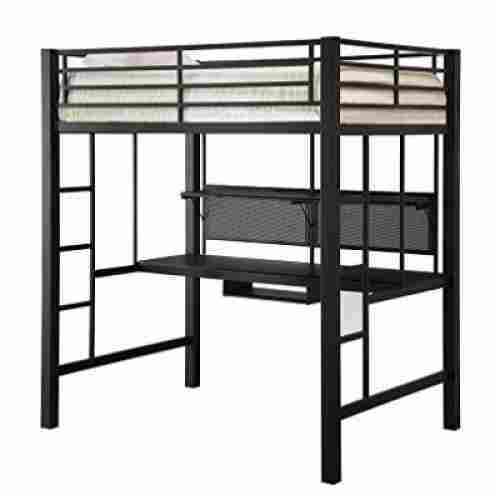 Health-wise, bed frames can absolutely make a difference in the quality of sleep that your teen gets each night. A proper frame can provide support, structure, and stability for them that an old frame might lack. While choosing a quality mattress is important, the frame that supports the mattress is just as important. They both aid in the structure of the bed itself and will dictate how much sleep, as well as the quality of sleep, your teen gets every night. There's nothing worse than tossing and turning every night because you can't get comfortable and that's one way a new bed frame can help. You should replace a mattress roughly every eight years which means your teen might be ready for a new bed anyway! Anything that has to do with revamping a bedroom up is usually exciting and new to a teenager. This is their chance to take a room they've been given and make it all their own and you can't underestimate the value of an alone space. A teen's bedroom is really a reflection of themselves and a place where they should feel calm and at ease. When they reach the age where they're responsible for cleaning and maintaining their rooms themselves, there's no reason for why they can't decorate it themselves, too. A bed might seem like a small gesture but, as we said before, it's really the focal point of the room. When you have a bed frame that allows you to sleep on a top bunk while working at a built-in desk below, it not only saves space but adds a level of ingenuity to a room design. Teens are actually getting two new spaces in one: One place for sleeping and one place for working, creating and researching. On the other hand, perhaps your teen wants something with a little more storage. A platform bed can be tremendous in the way of adding a little bit of height and dimension to a room and can function as storage for an entire closet's worth of things. Your teen will be amazed at how much extra room they'll have when they can store things in drawers that can easily be tucked away from sight under their bed. It can be a tough battle to win when it comes to letting your teenager decide on his or her own bedroom theme. However, a little creative freedom never hurts even if it's something as small as letting them choose their own new bed. This can be a great compromise for something such as painting or getting new furniture and might be the bargaining chip that you're looking for. Additionally, having a new bed style can really change the overall appearance and atmosphere of their room, opening up more options for them and allowing creativity to flow from this new centerpiece. A bed can be a great starting point for that day when your teen comes to you and says they're ready to change their room up a bit. And now you can even help them to do it! As you can tell, there are plenty of ways that your teen can make their space all their own. It really depends on what they're looking for and the feel for how they're trying to manipulate the space they've been given. This can also be a wonderful way for you, as a parent, to bond with them as well. Putting a bed together, setting it up, and even shopping for new bedspreads or linens can help tremendously in strengthing your bond. It's a fun project to invest in and is something that has a big reward payoff. It doesn't matter which type of bed your teen is thinking of, it's always important to take into consideration the height, style, and width of the bed itself. 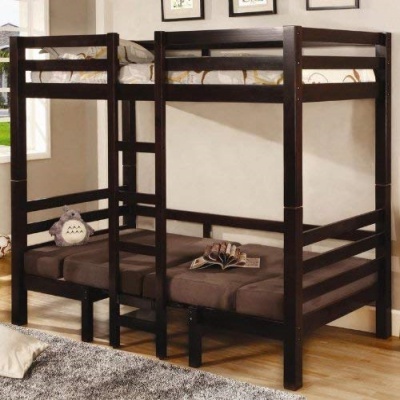 Since all of these beds are intended for teens to adults, height shouldn't be an issue. Kids often have trouble climbing into or jumping out of higher beds which would be an issue if we were writing for that age group but, luckily, we're not! Height for a teen might mean something completely different, such as just appealing to them as a natural aesthetic. If their previous bed was high then perhaps they'd want to stick with another bed that's just a high. If their previous bed was a queen and not a twin, then perhaps they'd want to stick with that width or go smaller in order to gain more space. The style matters as well, because something such as the bunk-style desk bed can reduce the foundation while a storage bed will have a strong foundation. It all depends on what they're looking for and what they're expecting in a bed. It's important to keep these expectations realistic and go over all of the pros and cons of each style before making a decision. Any age from 13 all the way up to adulthood. These beds aren't specifically "teenage-only" beds, but they are in a style that will appeal to teens of any age and will likely last for years. Any adult could enjoy these beds as well! q: Do these frames come in different sizes? We have all of that information listed under the "summary" section of each product. For the most part, many of these beds are offered in several varying sizes. That makes it easy for your teen to stick with the size they know or go up or down a size. 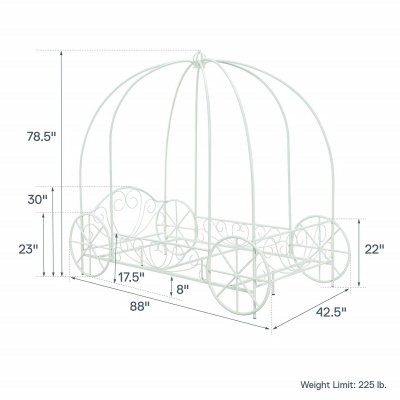 q: How much weight will the bunk-style bed hold? That information can also be found in the "summary" section of each product. Since we only have two on this list they'll be relatively easy to find, but each frame is designed to hold a significant amount of weight. They're also both supported with metal frames that are sturdy and highly durable. q: How easy would it be to paint the wood frames? q: Will standard bedding fit the size of these beds? For instance, will twin-sized bedding fit a twin bed or should I go a size up? These sizes are all standard and will work with most standard bedding. If your teen likes their sheets to be a big on the bigger side, though, you could always size-up for sheets and a comforter, and then get a standard-sized fitted sheet. q: Would any of these be considered unisex beds? Yes! In fact, all of these frames are unisex for the most part. There's no discrimination between a teenage boy or a teenage girl here, any of these bed styles would be great for anyone.